We have asked the most prominent experts in the field of international law, members of the International Expert Team of the Institute for Research of Genocide Canada to comment on an ongoing debate in Canada. The genocide that occurred in Srebrenica is in fact not freedom of speech and should be legally banned in Canada. The first comment is by Mr. Hasan Nuhanovic, a survivor of the Srebrenica genocide who has a campaign named “For truth and justice” which acts on behalf of other survivors and relatives of the victims. 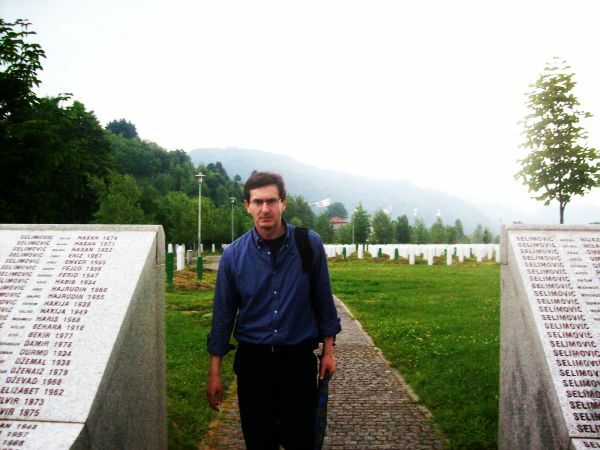 Srebrenica survivor Hasan Nuhanovic will never forget his last job in Srebrenica. “My last task as a UN interpreter was to translate the command of Dutch officers to members of my family that they must leave the UNPROFOR base in Potocari,” says Hasan, who worked as an interpreter for Dutch peacekeepers in the UN-protected “safe area”. Hasan’s family members were massacred along with more than 8,000 men and boys from Srebrenica in Europe’s worst single atrocity since the Nazi era in the Second World War. I was asked to comment on the ongoing debate in Canada on ‘freedom of speech vs. Srebrenica genocide denial as a violation that should be legally banned’. Perhaps, I should just simply ask: Why the denial of the Srebrenica genocide, or of any other case of genocide, should be treated differently from the Holocaust denial? But that question has been asked many times before and has caused controversies. Instead, here are a few other thoughts that I would like to share with the Canadian public. When just after the end of the World War Two, Raphael Lemkin, who coined the term ‘genocide’, spent years at the lobbies of the United Nations Head-Quarters building in New York, fighting the UN bureaucrats and trying to convince them to create international law on genocide prevention he had exactly that on his mind – a prevention. Thanks to Lemkin, a Polish Jew, to his tireless efforts, the UN Convention on the Prevention and Punishment of the Crime of Genocide was adopted in 1948 and entered into force on 12 January 1951. I cannot tell whether any genocide in the world was prevented since 1951 thanks to that Convention, and I believe that no one can. To my best knowledge the first case of genocide to which the Convention was applied, which resulted in binding judgements passed by two international courts, the International Court of Justice (ICJ) and the International Criminal Tribunal for former Yugoslavia (ICTY), was that referred to as ‘the Srebrenica Genocide’. Even though the judgement refers to the name of a small Bosnian town of Srebrenica it also states that the genocide was perpetrated:’…against the Muslims of Bosnia and Herzegovina’. So, yes the second part of the title of the Genocide Convention, the ‘Punishment’, was applied. However, many find that justice has not been served except for the fact that several high-ranking Bosnian Serb political and military leaders were convicted for their individual responsibility in the ‘Srebrenica genocide’. But, what about the first word in the title of the Genocide Convention, the ‘Prevention’? How can we even expect that genocide will be prevented in the future against the same ethnic group, or any other for that matter, if the international courts’ judgements on the Srebrenica genocide are not honored, and if the denial goes unpunished? The denial hurts and frustrates the survivors to the point that they fear for their future survival. But try to think about it not from the survivors’ perspective but from your own perspective – as Canadians, as citizens of the planet Earth, and ask yourself should you be at least as worried and aware about it as you are about the Global Warming problem, for example, or Canada’s concern about endangered species problem tackled by the Species at Risk Act (SARA). In order to protect the international law, in order to protect yourself, the future generations, we all have to tackle the problem of genocide denial. The ‘crime of all crimes’, as they also refer to genocide, cannot be a matter of a debate because what we talk here about is the essential legal tool that humanity needs to protect itself from evil.